Elisha could see that the young widow was desperate. She threw herself at the old prophet's feet and sobbed, "The creditor is coming to take my two sons to be his slaves!" The woman's husband had died unexpectedly and left her with a huge debt. 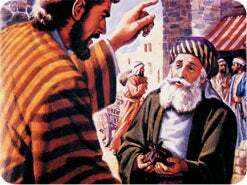 In Bible times, a lender had a right to repossess property and even take children as payment if a family could not pay the bills (Job 24:9). "What do you have in the house?" Elisha asked the distraught mother. "I have nothing in the house but a jar of oil," she replied. Little by little she had handed over all the furniture and valuables in her home to the cruel creditor until nothing remained but her two boys and this little jar of oil. Olive oil was considered a most basic essential. It was used for lighting, heating, cooking, and healing. 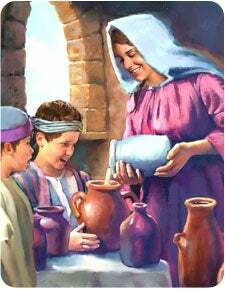 Elisha told the widow and her boys to go and borrow as many empty vessels as possible from their neighbors. They should bring them home, shut the door, and then pour the oil from her little jar into the empty containers. 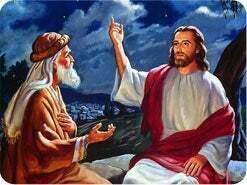 They did as Elisha instructed, and a wonderful miracle occurred. The oil in the little jar continued to flow out until all the vessels in the house were filled! "What shall we do now?" the young mother asked the prophet. "Sell the oil, pay your debt, and then you and your sons can live on the surplus," he said. This woman and her boys left Elisha's presence rejoicing and free because of the miracle of the oil. 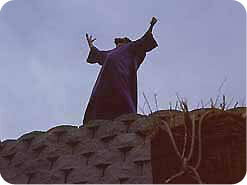 The Lord wants to free you from a ruthless creditor named Satan. 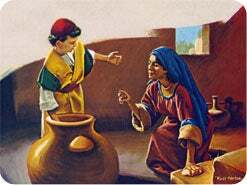 This miracle will happen when He fills your cup to overflowing with His special oil! 1. In the Bible, what is symbolized by a vessel and oil? Acts 9:15. 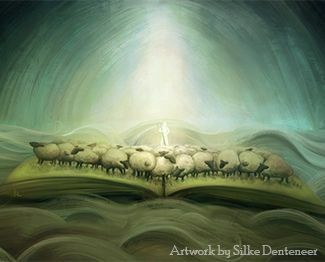 But the Lord said unto him, Go thy way: for he is a chosen _____________ unto me. 1 Samuel 16:13 Then Samuel took the horn of oil, and anointed him in the midst of his brethren: and the spirit of the Lord came upon David. NOTE: The Bible teaches that God is the potter and we are the clay vessels (Jeremiah 18:1-6; Romans 9:20, 21). Everyone is created with a purpose. 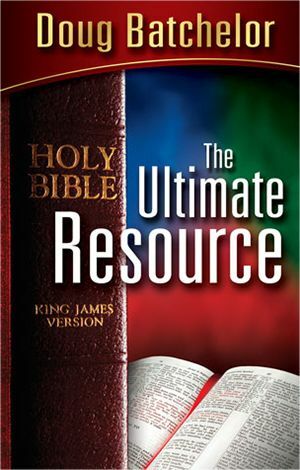 Oil is used throughout the Bible as a symbol of God's Spirit. 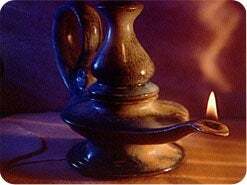 Pure olive oil was used to keep the lamp burning bright in the Hebrew temple as an illustration of how His Holy Spirit illuminates our minds. It is God's desire to fill all of His people with His Spirit (Joel 2:28). 2. Is the Holy Spirit an impersonal force, or is He God? Acts 5:3, 4. But Peter said, Ananias, why hath Satan filled thine heart to lie to the Holy ______? ... thou hast not lied unto men, but unto God. NOTE: The apostle Peter declared that lying to the Holy Spirit is lying to God. 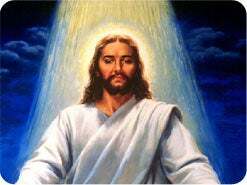 Furthermore, Jesus told us to baptize in the name of the Father, Son and Holy Ghost (Matthew 28:19, 20), thus indicating that the Holy Spirit is the third person of the Godhead, placed in full equality with the Father and the Son. 3. What is the primary work of the Holy Spirit? John 16:13. When he, the Spirit of truth, is come, he will _____ you into all truth ... and he will shew you things to come. John 14:26 He shall teach you all things, and bring all things to your remembrance, whatsoever I have said unto you. NOTE: Jesus promised to be with us always, and it is through the person of the Holy Spirit that He is with us and in us (John 14:17). 4. What is the one sin that cannot be forgiven? Matthew 12:32. 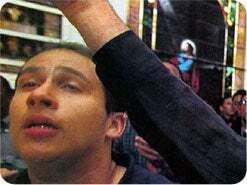 But whosoever speaketh _______ the Holy Ghost, it shall not be forgiven. NOTE: Blasphemy against the Holy Ghost is not a single offence, but a progressive resistance to truth that results in a final rejection of God's will (Hebrews 10:26, 27). The conscience is seared when a person repeatedly opposes and neglects the impressions of the Holy Spirit until he no longer hears His voice. Therefore, a person who has a haunting fear that he has committed the "unpardonable sin" very likely has not. 5. What are some of the gifts of the Spirit a person might receive? 1 Corinthians 12:8-10. 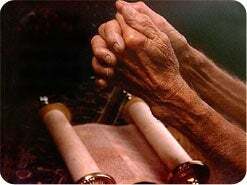 For to one is given by the Spirit the word of _______; to another the word of knowledge ...; To another faith ...; to another the gifts of healing by the same Spirit; To another the working of miracles; to another prophecy; to another discerning of spirits; to another divers kinds of tongues; to another the interpretation of tongues. NOTE: When the Holy Spirit comes into our lives, He brings different gifts. Not everyone receives the same gifts (1 Corinthians 12:29-31). Scripture often emphasizes the importance of being filled with the Spirit. Jesus taught in John 3:5 that "Except a man be born of water and of the Spirit, he cannot enter into the kingdom of God." Sadly, the Holy Spirit and His work is often misunderstood. Some people are taught that the Holy Spirit is an impersonal force; others deny His influence in people's daily affairs; and still others are taught that everyone who is filled with the Holy Spirit must speak in tongues. 6. 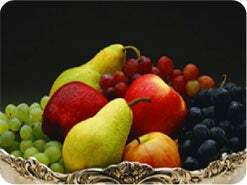 Which spiritual gift became a subject of controversy in the Corinthian church? 1 Corinthians 14:1, 2. Desire spiritual gifts, but rather that ye may prophesy. For he that speaketh in an unknown _______ speaketh not unto men, but unto God. NOTE: As in the days of the early Christian church, the gift of tongues has again become a subject of confusion and controversy. Therefore we have dedicated a large portion of this lesson to explaining what the Bible teaches about this spiritual gift. 7. 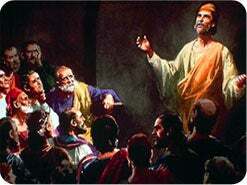 How did Jesus promise to help His disciples preach the gospel to all the world? Mark 16:17. They shall speak with new ________. NOTE: In the Bible, the word "tongue" simply means "language." Jesus' disciples were bright men, but most were uneducated. In order to help them take the gospel to the world, Jesus promised to give them a supernatural gift to speak foreign languages they had not formerly studied or known. 8. What happened when the disciples received the outpouring of the Holy Spirit? Acts 2:1, 4. And when the day of ___________ was fully come, ... they were all filled with the Holy Ghost, and began to speak with other tongues, as the Spirit gave them utterance. NOTE: Pentecost was a Jewish holy day that was celebrated 50 days after Passover. 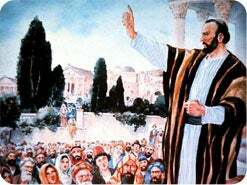 Devoted Jews from all over the world came to Jerusalem to worship. Through His Spirit, God gave the gift of tongues at this time to empower the disciples to share the gospel with these people in their native languages. Those who believed then carried the good news back to their respective countries. 9. What did these foreign Jews experience when the Holy Spirit was poured out? Acts 2:11. 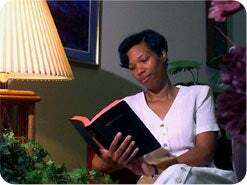 We do _____ them speak in our tongues the wonderful works of God. NOTE: It is sometimes suggested that the gift of tongues is a "heavenly language" understood only by God or by those with the gift of interpretation. The Bible clearly shows that both the disciples and those listening understood what was being preached--"the wonderful works of God." There are only three examples of speaking in tongues given in Scripture. We have looked at the first; now let's examine the last two for a clearer picture of this gift. 10. What happened when Peter preached to Cornelius and his household? Acts 10:44, 46. 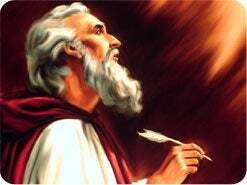 While Peter yet spake these words, the Holy Ghost fell on all them which heard the word. ... For they heard them speak with tongues, and ________ God. NOTE: Cornelius was of the Italian band (Acts 10:1), while Peter was a Jew and spoke Aramaic. History also tells us that the servants in a Roman home could be from anywhere in the world. Consequently, there were language barriers at this meeting. However, when the Holy Ghost fell on Cornelius and the members of his household, the men who accompanied Peter could understand them speaking in languages other than their native tongues. They heard them "magnify God" in these languages. When later reporting this experience to church leaders in Jerusalem, Peter said, "The Holy Ghost fell on them, as on us at the beginning." Acts 11:15, emphasis added. 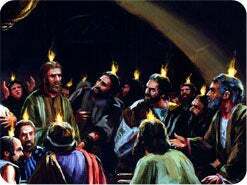 Cornelius and his household received the same gift of tongues as did the disciples on the day of Pentecost. They spoke languages that could be understood. 11. 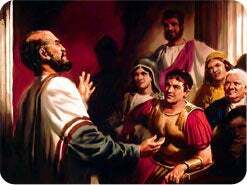 What happened when Paul preached to 12 Ephesian disciples? Acts 19:6. The Holy Ghost came on them; and they spake with tongues, and _____________. NOTE: Paul, who was the most educated and widely traveled of the apostles, spoke many languages (1 Corinthians 14:18). When the Holy Spirit came upon these 12 men of Ephesus, Paul and Luke could understand them prophesying in languages they had not previously known. 12. What does the Bible say about speaking in a tongue that is not understood? 1 Corinthians 14:9. Except ye utter by the tongue words _______ to be understood, how shall it be known what is spoken? 1 Corinthians 14:19 I had rather speak five words with my understanding, that by my voice I might teach others also, than ten thousand words in an unknown tongue. NOTE: Paul repeatedly explains that the purpose for a tongue (language) is to communicate or to teach truth. A Greek word for "unknown" is not found in any original Bible manuscripts, but was supplied by translators to indicate that the language was foreign to the majority present. The church at Corinth was a melting pot of many different nationalities, and sometimes the services became confusing when members would pray, testify, or preach in languages unknown to the others present. This is why Paul commanded them to keep silent, if speaking in a tongue unknown to the majority, unless someone was there to interpret (1 Corinthians 14:28). The lesson for us is that we should not speak or pray in a tongue that others present cannot understand. 13. What was one of the main characteristics of ancient Babylon? Genesis 11:7, 9. Let us go down, and there _______ their language, that they may not understand one another's speech. ... Therefore is the name of it called Babel. 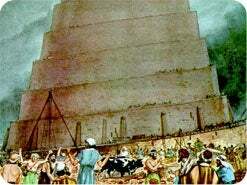 NOTE: The tower of Babel is the place where the languages of the world were first confounded. The Hebrew word for both Babel and Babylon is "babel," meaning "confusion." In Revelation 18, God calls His people out of spiritual Babylon. One of the characteristics of spiritual Babylon is a confusion of tongues. 14. 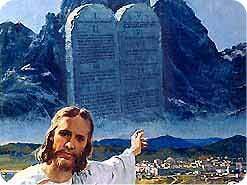 Does the Spirit fill those who deliberately break God's commandments? John 14:15-17. If ye love me, keep my _____________. And I will pray the Father, and he shall give you another Comforter, ... Even the Spirit of truth. Acts 5:32 The Holy Ghost, whom God hath given to them that obey him. NOTE: The tremendous power of the Holy Spirit cannot dwell in those who refuse to obey God's commandments. 15. Paul emphasized that we should desire which spiritual gift? 1 Corinthians 14:4, 5. He that speaketh in an unknown tongue edifieth himself; but he that __________ edifieth the church. ... Greater is he that ___________ than he that speaketh with tongues. 1 Corinthians 14:12 Forasmuch as ye are zealous of spiritual gifts, seek that ye may excel to the edifying of the church. NOTE: In spite of the fact that Paul attached greater importance to the gift of prophecy than to the gift of tongues, some are now teaching that every person who is filled with the Holy Spirit will speak in tongues. Out of more than 25 Bible examples of God filling His people with the Spirit, only three times is the gift of tongues connected with it. Of the 14 New Testament books written by the apostle Paul, he mentions tongues in only one--1 Corinthians. Of the 27 books in the New Testament, only three make any reference at all to speaking in tongues. 16. What is the main reason why God fills people with His Spirit? Acts 1:8. But ye shall receive __________, after that the Holy Ghost is come upon you: and ye shall be witnesses unto me. Acts 4:31 They were all filled with the Holy Ghost, and they spake the word of God with boldness. NOTE: God fills us with His Spirit to give us power for witnessing! 17. Is it possible to tell whether or not a person has been filled with the Holy Spirit? Matthew 7:20. Wherefore by their ______ ye shall know them. NOTE: We determine that a person has received the baptism of the Holy Spirit not by the gifts of the Spirit, but by the fruits of the Spirit, which are love, joy, peace, longsuffering, gentleness, goodness, faith, meekness, and temperance (Galatians 5:22, 23). 18. 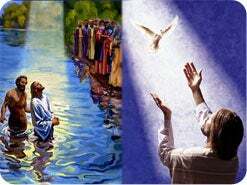 How can I receive the baptism of the Holy Spirit? Luke 11:13. If ye then, being evil, know how to give good gifts unto your children: how much more shall your heavenly Father give the Holy Spirit to them that ___ him? NOTE: Just as Jesus had the Spirit without measure, we may ask God to fill our vessels to overflowing, but we must first be willing to empty ourselves by surrendering our hearts. 19. Jesus is waiting and yearning to pour the precious oil of the Holy Spirit into your life. Would you like to ask Him now to take possession of your mind and heart?